If you’ve got metabolic syndrome, you may have a raised risk for urinary tract symptoms like bladder leakage, having to urinate more often, having to get up at night to go and feeling an urgent need to go. And you may be able to fight those symptoms by losing weight. Researchers estimate that a quarter of all obesity-related cancers in 2012 were attributable to the rising average body mass index (BMI) in the population since 1982, and were therefore “realistically avoidable”. People say that they would be more likely to hire someone who has lost weight through exercise and dieting than through surgery. This is just one of the stigmas faced by obese people who undergo weight-reducing bariatric surgery, reports Robert Carels of East Carolina University in the US and his team of researchers. The findings are published in Springer’s journal Obesity Surgery. Doctors and pharmacists often do not take obesity into account when prescribing medication. For this, more insight into the influence of obesity on the distribution and elimination of drugs is of the utmost importance. This is emphasized by Catherijne Knibbe in the most recent issue of the Annual Review of Pharmacology and Toxicology. How well does bariatric surgery work? The number of bariatric surgeries done each year in the United States has ballooned. Now, in an August 27 state-of-the-art review in The BMJ and a September 3 editorial in JAMA, David Arterburn, MD, MPH, weighs the evidence on the benefits and risks of the various types of this surgery. "It’s critical that we find effective—and cost-effective—ways to treat severe obesity," said Dr. Arterburn, an associate investigator at Group Health Research Institute, a Group Health physician, and an affiliate associate professor of medicine at the University of Washington School of Medicine. In an analysis of the type of bariatric surgery procedures used in Michigan in recent years, sleeve gastrectomy (SG) surpassed Roux-en-Y gastric bypass (RYGB) in 2012 as the most common procedure performed for patients seeking this type of surgery, and SG became the predominant bariatric surgery procedure for patients with type 2 diabetes, according to a study. Weight loss surgery can curb alterations in brain activity associated with obesity and improve cognitive function involved in planning, strategizing and organizing, according to a new study published in the Endocrine Society’s Journal of Clinical Endocrinology & Metabolism (JCEM). Weight-loss surgery appears to have an additional side benefit — it may improve urinary incontinence symptoms in women, according to a new study. The study found that nearly half of women in a weight-loss surgery program reported having incontinence prior to the procedure. After surgery, most of those women said their urinary symptoms either improved or disappeared, said study researcher Dr. LesleeSubak, professor of obstetrics, gynecology and reproductive sciences at the University of California San Francisco School of Medicine. Adults with Type 2 diabetes achieve better blood glucose (sugar) control two years after undergoing laparoscopic sleeve gastrectomy than do patients who receive standard medical diabetes care without this weight loss surgery, a new study finds. The results were presented Monday at the joint meeting of the International Society of Endocrinology and the Endocrine Society: ICE/ENDO 2014 in Chicago. Can Weight-Loss Surgery Lower Cancer Risk for the Obese? Weight-loss surgery may do more than lower the risk of heart problems and improve type 2 diabetes in obese patients: A new review suggests it may also lower their chances of a cancer diagnosis. The report was published in the journal Obesity Surgery. It’s no news that Americans have become more obese during the past 15 years, but a new study adds an interesting perspective—the dramatic gains may be almost entirely due to lack of physical activity, and not an increase in caloric intake. High body mass index (BMI) is associated with multiple cardiovascular diseases. However, emerging data suggest that there is an "obesity paradox," that being overweight may actually protect patients from cardiovascular mortality. Investigators have now confirmed that the risk of total mortality, cardiovascular mortality, and myocardial infarction is highest among underweight patients, while cardiovascular mortality is lowest among overweight patients, according to two reports published today in Mayo Clinic Proceedings. Using experimental models, researchers at Boston University School of Medicine (BUSM) showed that adenosine, a metabolite released when the body is under stress or during an inflammatory response, stops the process of adipogenesis, when adipose (fat) stem cells differentiate into adult fat cells. Are hormones causing children’s weight gain? The number of children who are obese remains alarmingly high in the U.S. and, unfortunately, diseases associated with obesity are on the rise. Worried about their overweight children, many parents wonder if other diagnoses, such as hypothyroidism, could be the reason behind their child’s weight gain. But according to experts more often than not the underlying issues are more strongly influenced by environmental factors, such as largely sedentary lifestyle or a caloric intake. Laparoscopic sleeve gastrectomy (LSG) may offer better diabetes control and improved outcomes compared to patients who follow medical care only but the T2DM improvements for surgical patients may not be a permanent solution, according to a comparative study (‘Clinical outcomes of sleeve gastrectomy in veterans with type 2 diabetes’, abstract No. 277) presented at the American Association of Clinical Endocrinologists’ annual meeting in Las Vegas. Loop duodeno-enterosomies with sleeve gastrectomy can be safely performed, according to a group of researchers Germany and Poland. The study, ‘Pylorus preserving loop duodeno-enterostomy with sleeve gastrectomy – preliminary results.’ published online in BMC Surgery, concludes that this approach could ‘open new alternatives in bariatric surgery with the possibility for inter-individual adaptation’. In the paper, the investigators from Silesian Medical University, Katowitz, Poland, the University of Freiburg and University of Schleswig-Holstein, Lübeck, Germany, present their early results of a proximal postpyloric loop duodeno-jejunostomy associated with a laparoscopic sleeve gastrectomy (LSG), compared to results of a parallel, but distal LSG with a loop duodeno-ileostomy as a two-step procedure. A study by Cleveland Clinic researchers show bariatric surgery is a highly effective and durable treatment for type 2 diabetes in obese patients, enabling nearly all surgical patients to be free of insulin and many to be free of all diabetic medications three years after surgery. The STAMPEDE (Surgical Therapy And Medications Potentially Eradicate Diabetes Efficiently) trial was simultaneously published in the New England Journal of Medicine and presented today at the Annual Scientific Session of the American College of Cardiology in Washington, D.C.
At a luncheon sponsored by the American Heart Surgery Association in Detroit on Friday, Rosie O’Donnell revealed that she underwent vertical gastric sleeve surgery according to TVGuide.com. The story which first appeared in People magazine reports that since having the procedure in July, O’Donnell says she has lost 40 pounds and currently weighs 190 pounds. The weight loss surgery reduces one’s stomach size by approximately 25 percent and thereby limits the amount of food your stomach can hold. “I did it to save my life,” O’Donnell, who suffered a heart attack in 2012, said. She also had high blood pressure, high cholesterol and was pre-diabetic. Sleeve Gastrectomy: Trend or responsibility? – What you have to know before doing this surgery! Obesity kills: life expectancy of a 20-year-old person with a BMI of 40 (for example 121kg/174cm tall) is 13 years shorter compared to a person of the same age with a normal BMI. Obesity is measured by body mass index or “BMI.” BMI is the weight in kg divided by squared meter height. Surgery has been proven to be the most effective, and long lasting treatment for morbid obesity and its related conditions, and results in significant weight loss compared to slimming diets (“yo-yo” effect of weight regain) or intra-gastric balloons (weight regain after removal). 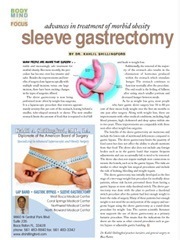 This new trend to do Sleeve Gastrectomy completely changes the person’s life and life expectancy. People are realizing that after surgical weight loss that they will enjoy a new quality of life. 96 percent of the patients are satisfied with their life and body changes. Suite 235, Boca Raton, FL 33428. © Dr. Shillingford - Gastric Sleeve Florida.